Today, the International Energy Agency released a special report of its World Energy Outlook, entitled Redrawing the Energy-Climate Map. The report is notable not only for its substantive conclusions – but for what it signifies. The report starts by emphasizing that energy-related CO2 emissions are a crucial driver of global warming, that they are increasing rapidly, and that as a result the world is not on target to keep concentrations of greenhouse gases below the level that would provide even a fifty-percent probability of limiting the increase in average global temperatures to two degrees – a commonly cited benchmark to prevent the worst impacts of climate change. Standard fare, perhaps – but noteworthy nonetheless coming from the world’s leading energy authority. The IEA estimates that these four measures would reduce energy-related GHG emissions by 3.1 GT CO2-eq in 2020, relative to IEA’s “New Policies” reference scenario – corresponding to 80% of the reduction required to be on a 2-degree path. Four policies, using widely available technologies, imposing no net economic cost on any individual region or major country, that put the world in the position to make the turn to climate safety. 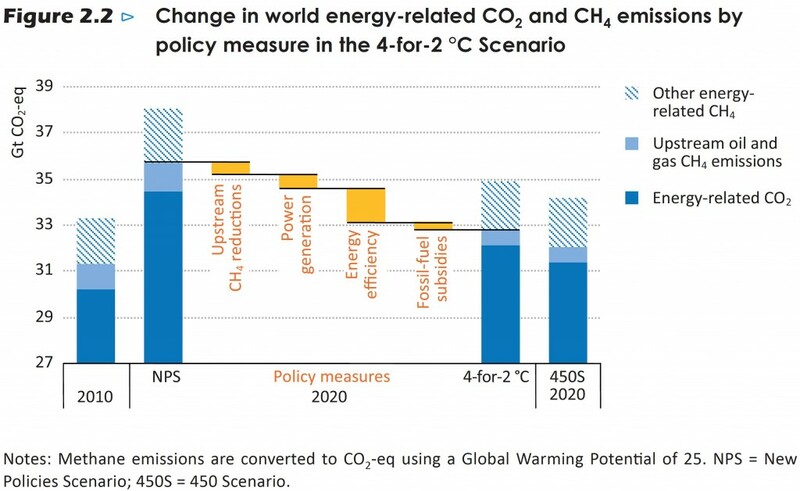 IEA’s report also discusses the vulnerability of the energy sector to climate change, and emphasizes that delaying climate action will drive up the costs of meeting a 2 degree target later. The report estimates that putting off action until 2020 would trim near-term investment by $1.5 trillion in the short run – but at the cost of requiring an additional $5 trillion to be spent in subsequent years. In present-value terms, using a 5% discount rate, delay doubles the cost of action: from $1.2 trillion to $2.3 trillion. This is an argument that we at EDF — and others — have been making for some time. 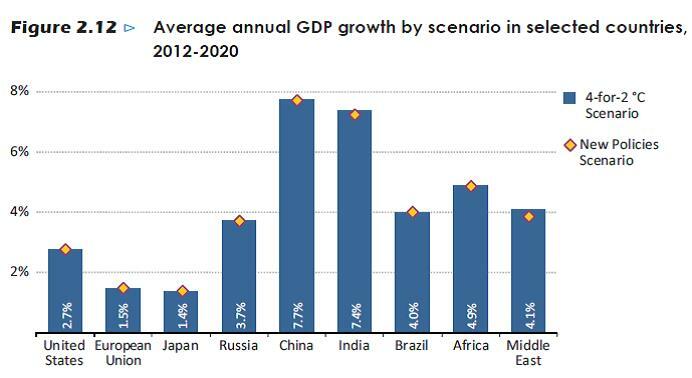 But it is a crucial one nonetheless – and the IEA analysis gives some added analytical weight to the argument. These findings are especially welcome coming from IEA, a world-respected authority on energy markets and policy that was founded to facilitate international coordination among oil-consuming countries. Indeed, the messenger may be nearly as important as the message. What launched the IEA was the 1973-4 oil crisis. Now, nearly forty years later, the IEA report makes clear that the real energy-related threat to economic prosperity is not an oil shock, but a climate shock. To be sure, the four policies analyzed in this report won’t fully suffice to address climate change in the long run: indeed, much more ambition will be needed. 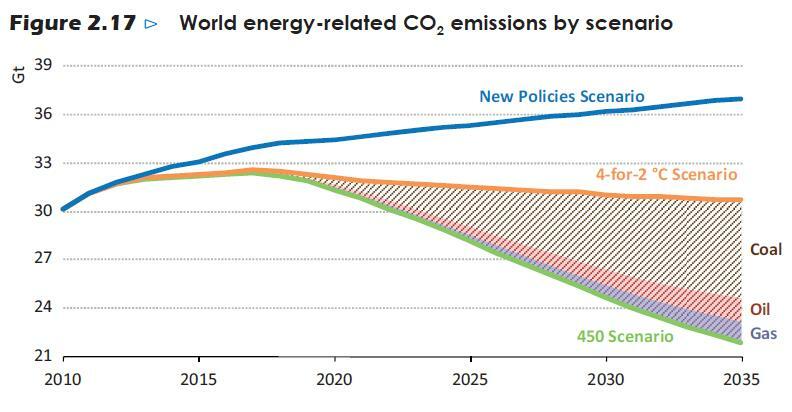 Under the “4-for-2˚C” scenario, the IEA estimates that world energy-related emissions will peak and start to decline before 2020 – but we’ll still need concerted action on a global scale to get greenhouse gas emissions onto a steepening downward trajectory. Acknowledging this point, IEA’s report underscores the importance of continued innovation in low-carbon technologies in transport and power generation (including carbon capture and storage), and highlights the vital importance of a long-term carbon price. Beyond the scope of the report, there’s much to be done outside the energy sector – in particular by curbing tropical deforestation, and promoting the spread of agricultural practices that can achieve the “triple win” of greater productivity, greater resilience to climate, and lower environmental impacts (including GHG emissions). And all of these efforts must be carried out in tandem with the overarching challenge of promoting broad-based economic prosperity around the globe, as President Jim Yong Kim of the World Bank has repeatedly emphasized. But the bottom line is that one of the most hopeful publications on climate change you’ll read this year has come from the International Energy Agency, of all places. Here is a road map toward a cleaner, more secure future. Now it’s up to us to take it. Cross-posted from EDF’s Climate 411 blog. While Washington is stuck in gridlock, other jurisdictions around the world are moving forward on climate policy. Market-based approaches to cutting carbon are in place in jurisdictions accounting for nearly 10% of the world’s population. 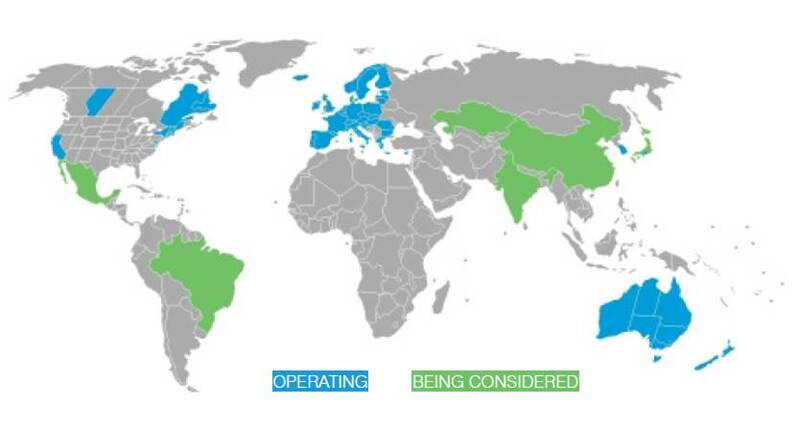 Above: areas shaded blue have emissions trading programs that are already operating; areas in green have programs that are launching or being considered. Market-based approaches to cutting carbon are already in place in jurisdictions accounting for nearly 10% of the world’s population and more than a third of its GDP. Many more jurisdictions are either moving ahead with market-based measures, or actively considering them. As interest grows around the world, policymakers are increasingly seeking information about the range of existing and proposed initiatives. In response, EDF has partnered with the International Emissions Trading Association (IETA), a trade association that represents businesses involved in carbon trading and climate finance, to launch The World’s Carbon Markets: A case study guide to emissions trading. The online resource provides detailed information about key design elements and unique features of 18 emissions trading programs that are operating or launching around the world. EDF has also put together a quick reference chart that makes comparing the 18 programs even faster and easier. Market-based policies are a proven way to limit carbon pollution and channel capital and innovation into clean energy, helping to avert the catastrophic consequences of climate change. While emissions trading programs around the world, like the ones we have looked at in detail, vary in their features, they all share the key insight that well-designed markets can be a powerful tool in achieving environmental and economic progress. The countries, states, provinces and cities highlighted in this report, which are moving ahead with strong action on climate change, constitute a vital and dynamic world of “bottom-up” actions that complement multilateral efforts such as the ongoing United Nations climate negotiations. Jurisdictions considering market-based approaches can use this new resource to learn from their growing number of peers already headed in that direction. We expect the site will also be of value for policy makers, academics, analysts, journalists, and colleagues in the NGO community and beyond. If you find the information in The World’s Carbon Markets case studies helpful, please share edf.org/worldscarbonmarkets with your networks. Indonesia’s tropical forests are the world’s third-largest, covering more than half of the country and possessing some of the richest and most unique biodiversity on earth. But Indonesia has lost more than 20% of its forest since 1990. 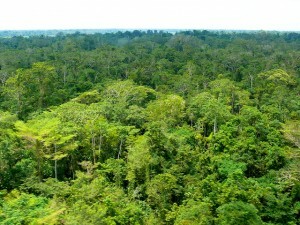 The carbon released through deforestation and related changes in land use has made Indonesia the third-largest national contributor of greenhouse gas emissions (behind China and the U.S.) – and also one of the most promising areas in the world to put into action effective policies to reduce deforestation and combat climate change. In a study developed in collaboration with Indonesian government and non-governmental partners and published in one of the world’s leading scientific publications, the Proceedings of the National Academy of Sciences, my colleagues and I have found that the ways countries could choose to set up a framework of economic incentives for reducing deforestation really matter. While most economic analyses of the potential for reducing deforestation emissions have been at a high theoretical level, our study takes the analysis closer to the level of policy implementation. Worldwide, emissions from deforestation contribute about 15% of global greenhouse emissions; the Indonesian government estimates 85% of its country’s emissions come from agriculture, forests and land-use change. Policies to Reduce Emissions from Deforestation and forest Degradation (REDD+) aim to provide incentives for forest conservation by giving living forests an economic value, and have the potential to cut greenhouse gas emissions substantially right away while protecting ecosystems and generating economic and social benefits for indigenous and local communities. Our results show that Indonesia can maximize its emissions reductions while staying within its budget through a comprehensive national policy framework that both encourages broad participation and includes rewards for reductions measured across larger geographic scales, such as the political units of districts or provinces. This system would be superior to more traditional approaches based on payments only on a site-by-site basis, which run the risk of overpaying certain sites while providing insufficient incentives to others, and thus have an increased risk of emissions shifting to these locations (“leakage”). Graph showing deforestation in Indonesia from 2000–2005. (a) observed deforestation; (b) modeled expected deforestation without REDD+; (c) expected deforestation with “improved voluntary incentive structure” for REDD+ at a carbon price of $10 per ton. A cap-and-trade or tax-and-subsidy REDD+ program with international carbon payments at $10/ton showed the highest potential benefits for Indonesia during the 2000-2005 study period. Such a program could: reduce national emissions from deforestation 20-31% over five years; avoid 163-247 million metric tons of carbon dioxide from deforestation emissions every year; and inject into Indonesia’s national REDD+ program a net budget surplus of $1 billion per year. A well-structured voluntary incentive structure could be a more politically attractive option, compared to a mandatory system. To be effective environmentally but not exceed the program budget, a voluntary REDD+ system must balance robust and widespread local incentives with maintenance of revenue, through policies that, for example, combine shared revenues and responsibilities for the program between national and subnational governments, and that make payments for emissions reductions to districts or provinces rather than individual site. Operating at these larger scales helps target resources and account for possible emission shifts (“leakage”) as well as less predictable emissions at more local levels. Structured this way, Indonesia’s REDD+ program could: reduce national emissions from deforestation 17-26% over five years; avoid 136-207 million metric tons of carbon dioxide from deforestation emissions each year; and, with international carbon payments at $10/ton, yield a net budget surplus of $331 million per year for Indonesia. Either system would be more than twice as effective at reducing emissions as a “basic voluntary structure,” where payments would be made for voluntary reductions in emissions at the level of individual sites on a solely project or landowner basis. These results show the way REDD+ policies are designed can have important implications for national and local budgets and make a huge difference in achieving large-scale, cost-effective emissions reductions. This is the first time potential emissions reductions from deforestation in Indonesia have been estimated using actual historical data on how deforestation varies with economic factors. This provides a stronger basis for informing REDD+ policies than prior analyses that rely on various assumptions for how readily deforestation can be reduced. To conduct our analysis, we used a model called OSIRIS (the Open Source Impacts of REDD+ Incentives Spreadsheet), a set of free, transparent, open-source, spreadsheet-based decision support tools. The model estimates and maps the climate, forest and revenue benefits of alternative policy decisions for REDD+. EDF and Conservation International developed a version of OSIRIS for Indonesian policy makers in collaboration with its National Council on Climate Change, and with co-authorship from Padjadjaran University and World Resources Institute. We have versions of the model for other countries and are working to enhance the analysis and extend the model to additional countries. Our analysis, published in this week's Proceedings of National Science, offers valuable information for Indonesia's REDD+ strategy. Indonesia’s President Susilo Yudhoyono committed in 2009 to reducing his country’s greenhouse gas emissions by 26-41% below its “business as usual” levels (the amount of emissions Indonesia expects to hit if no efforts are made to curb emissions) by 2020. These goals could translate to substantial reductions below current levels, based on the best current projections. In May 2011, Indonesia and Norway signed a $1 billion agreement to cooperate on reducing emissions from deforestation and forest degradation. Currently the Indonesian government is developing its National REDD+ Strategy, and our analysis offers some valuable information as the country decides how to implement REDD+. We’ve already received positive feedback from our analysis – in fact, the National Council on Climate Change in Indonesia published our findings in a joint policy memo and chapter in a book about REDD+. We look forward to Indonesia’s policy-makers’ using the best knowledge and technology to structure a REDD+ framework that will provide the economic incentives to achieve the country’s enormous potential to fight climate change and protect biodiversity. You can read more in our full PNAS article, “Structuring economic incentives to reduce emissions from deforestation within Indonesia,” our joint press release with Conservation International and at the ORISIS webpage. New Zealand is currently conducting a review of its emissions trading system for greenhouse-gas pollutants, as required by the law that enacted the program. Our comments focus on developments in carbon markets including California, Europe, and elsewhere, suggesting some enhancements that New Zealand policy-makers may wish to consider in the post-2012 environment. 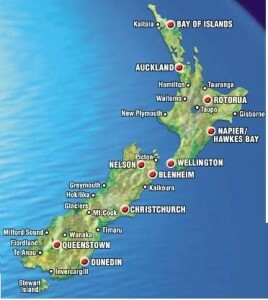 Read more about EDF’s Submission to New Zealand’s Emissions Trading Scheme (ETS) Review 2011. Cross-posted from Reuters AlertNet and EDF’s Market Forces blog. The United Nations climate conference begins today in Cancún, Mexico — a two-week intensive negotiations session with nearly 200 countries meeting to broker a global deal addressing climate change, in a city best known for its white-sand beaches and spring break getaways. Beyond the city’s reputation as a vacation destination and the conference’s casual dress code, in Cancún countries are finding themselves at a critical point when they need to restore momentum toward a global climate deal, even as many are embarking on their own domestic and regional efforts to curb climate change rather than waiting on a global deal. The U.N. climate conference starting today in Cancún can make progress in global climate issues, especially in avoiding deforestation, transparency and finance. Countries are already taking their own actions domestically to curb climate change. The clouds of last year’s hyped meeting in Copenhagen still loom over the negotiations, and both environmental groups and countries themselves have been tempering expectations for the Cancún summit after Copenhagen concluded with countries making only non-binding commitments in the conference’s final hours. Despite the lowered expectations this year, it’s critical to remember that Cancún is an opportunity for countries to move forward on critical climate change issues. There is still positive progress to be made on curbing deforestation, increasing transparency, and financing climate change mitigation activities. Since the Copenhagen conference, there have been clear signs that parties are still interested in reaching an agreement within the U.N. process, and Cancún is their opportunity to show they can find a way — despite disagreements over some of the fundamental issues. While the U.N. will continue to be the preferred forum for reaching a global deal, the good news for a planet that can’t wait is that a parallel process is emerging at national and state levels, with countries and regions developing their own paths forward through domestic actions and bilateral and multilateral deals to curb climate change. One example of success in this parallel process is when earlier this month the Governors of California, the Brazilian state of Acre and the Mexican state of Chiapas signed a Memorandum of Understanding establishing a working group to promote efforts on Reducing Emissions from Deforestation and Degradation (REDD+) at the state level. The MOU — whose working group will make recommendations to California’s Air Resources Board on how reductions in deforestation from Acre, Chiapas, and eventually other states enter California’s carbon market — clearly shows that state governments can take effective steps to substantially reduce emissions and grow their economies without waiting for an international agreement. 1. Implementation of Reducing Emissions from Deforestation and Forest Degradation (REDD+). REDD+ policies have the best chances of advancing at Cancún of any of the climate effort. But a major consideration in developing REDD+ must be indigenous peoples, who are the best-suited to monitor and protect their land from deforestation. The REDD+ language needs to strengthen protections for indigenous peoples, increase the role of stakeholders in the negotiating process and provide greater clarity on technical issues in establishing baselines for emissions and plans for implementing REDD. 2. Launch comprehensive and transparent monitoring, reporting and verification and reporting (MRV) systems that may be used in bilateral and regional agreements. Experience shows that nations often are willing agree to more comprehensive inspection and verification systems on a bilateral basis than in a broader multilateral context. We encourage negotiators to launch a process in Cancún to develop an international framework for monitoring, verification and reporting that can simultaneously be used by countries pursuing bilateral and regional approaches. 3. Establish transparency and accountability for climate financing efforts in developing nations, whether the sources are public or private. It is clear from the Advisory Group on Finance report that getting to $100 billion per year in climate funding is possible, though it will require serious political will and incentives, and a price of at least $20-$25 per ton of carbon dioxide emissions by 2020. Direct public finance will be necessary to spur private finance, but regardless of the source, there must be transparency and accountability in how the funds are generated, allocated, and spent. We must recognize that eventually it is private capital, the engine of global growth, that will shape the new carbon constrained global economy. EDF has a team of experts on the ground in Cancún, and we’ll be posting on this Climate Talks blog regularly — check back with us soon.